The English Channel separating the UK and France is home to some of the strongest tidal currents in the world, and the Ports of Normandy Authority (PNA) and local government authorities, as well as French energy and engineering giants Alstom, EDF Energies Nouvelles, and GDF Suez, want to tap into them. PNA announced plans to invest €60 million (US$78 million) to expand and outfit the ports of Cherbourg and Caen-Ouistreham so as to facilitate development of marine tidal power generation systems and renewable marine energy industry facilities, according to a PNA press release. France ranks second in Europe, following the UK, in terms of assessed marine energy potential. Raz Blanchard and the Passage du Fromveur are the two areas of French marine territories with the greatest potential. Taken together they represent 80% of France’s total prospective tidal power generation capacity, with the Raz Blanchard in the English Channel alone accounting for half. Installing marine turbines in Raz Blanchard, along with grid interconnections, would also provide clean and renewable electricity to homes and businesses on the UK Channel Island of Alderney. Recognizing the potential tidal and marine energy resources of Normandy and Brittany, PNA and local authorities of Basse-Normandie also see the potential to realize a healthy, sustainable future for the region’s residents and economy based on clean renewable marine energy; tidal power in particular. “There is no doubt that the French government and the Alderney authorities face many challenges in the implementation of their plan to harness ocean currents in order to produce energy,” PNA states in its press release. 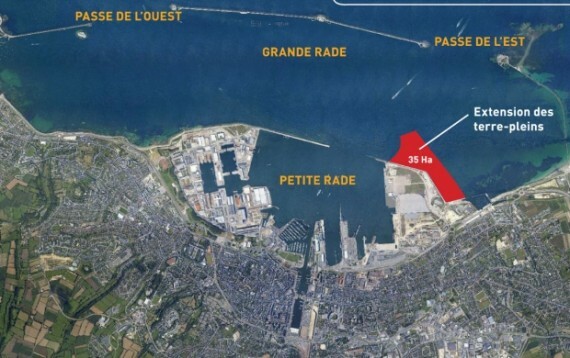 Realizing this vision requires expanding the port of Cherbourg by 35 hectares (~86.5 acres) according to PNA, which is ready to invest €60 million to extend the port on reclaimed land into Cherbourg’s outer harbor. Project work is slated to occur between 2014 and 2016. Looking to inform and gain the support of local residents in Basse-Normandie, PNA held public consultations between October 19 and November 19. The large majority of participants expressed support for PNA’s plan according to the port authority, particularly with regard to the employment and economic development that is envisaged. PNA is incorporating public feedback into its harbor expansion and MRE plans with the intention of releasing an updated and improved version to the public this spring. Tidal & Marine Energy: The Basis for Sustainable Socioeconomic Development? The potential energy contained in Normandy and Brittany’s tidal currents and offshore winds have attracted the attention of France’s largest energy and engineering concerns. GDF Suez last June announced that its subsidiary, Eole Generation, would conduct two tidal power project feasibility studies: one in lower Normandy’s Raz Blanchard and a second in the Passage du Fromveur off Brittany’s Finisterre coast. Eole’s feasibility study at Raz Blanchard entails installing a pilot 3 to 12-megawatt (MW) tidal power plant consisting of 3 to 6 Voith Hydro HyTide tidal power turbines. If that proves successful, management will look to install as many as 100 marine turbines on site. Eole has partnered with tidal power engineering specialist Sabella in order to carry out its feasibility study in the Passage du Fromveur. The agreement provides Eole with access to Sabella’s research on the site, as well as on its prototype D10 marine turbine. GDF Suez management has made renewable energy a focal point of the company’s business strategy. GDF group companies own and operate nearly 10,000 MW of installed capacity in France. Nearly 50% of that comes from renewable energy sources, according to management. There’s also enormous tidal and marine renewable energy potential across the Channel. In a recently released report the UK Crown Estate estimates that the island nation’s total tidal power capacity totals some 153GW. “While the science of wave and tidal resource assessment is still emerging, and future work will clarify the resources that are practically available, it is clear that wave and tidal energy could contribute substantially to the UK’s electricity needs,” Rob Hastings, director of the Crown Estate’s energy and infrastructure portfolio commented.